We can personalise the classic duffle bags with your initials and/or numbers in a choice of different colours. These will be stitched onto the bag with traditional zigzag stitch beside the diagonal line of zigzag stitching. 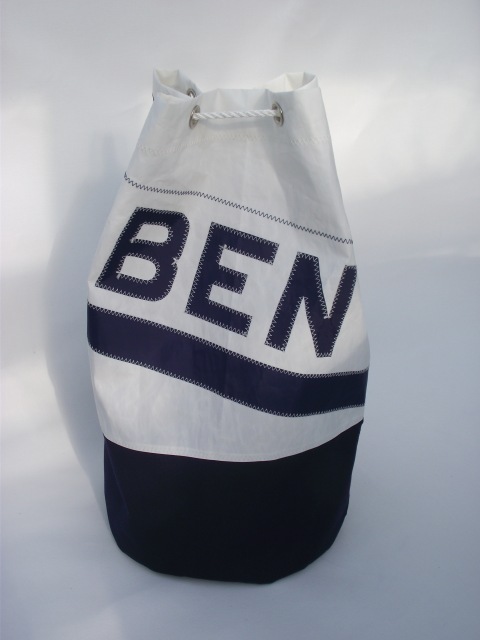 Made from new white sailcloth they have a practical navy blue acrylic canvas base with an external zipped pocket near the bottom large enough for mobile phone, wallet, car keys etc. The rope handle runs through seven nickel plated brass eyelets at the top and is spliced to a stainless steel clip and that is attached to a stainless steel ring on the bottom. There is a webbing slider to help keep the bag closed. The bag is sewn with our usual sailmakers U.V. treated thread with three rows of stitching on the base for added strength, giving longevity to this iconic style of bag. We make them in three different sizes, depending upon your anticipated use. This simple bag with its nautical heritage can be used by boys and girls of all ages. They are so easy to chuck over your shoulder and take with you, sailing, swimming, pilates, or the beach. The photos show the medium and large sizes. Care instructions: Wash by hand at 30 degrees centigrade in gentle eco-friendly washing liquid. Hang to dry naturally. Please do not add bleach or tumble dry.